The great Chinese philosopher Confucius wrote “Music produces a kind of pleasure which human nature cannot do without,” nearly 2,500 years ago. This truth remains; music is a life force that nurtures the human spirit, provides inspiration, and awakens creativity. Our lives would not be complete without music. Teaching is as much of an art as music, or any other discipline. When musical passion and teaching combine, students of all ages flourish. Primary and secondary schools have music teaching positions whether for general music classes, band, specific instrument instruction, or choral. Teaching music in school, whether in the private sector or public sector, helps children develop skills not only in music, but also increases literacy, physical coordination and general cognitive skill. A 2008 study conducted by Dr. Sylvain Moreno, a leading researcher in cognitive neuroscience, concluded that there is a “positive transfer from music to speech.” This nine month study of non-musician children found that after musical training, non-musical brain functions including reading and linguistics increased. Teaching music to children isn’t just about the music, it also assists children in other skills, setting them on a path for educational success. Music teachers in high schools may teach a general class in addition to leading the marching band, chorus, orchestra or ensemble. In some high schools, regional and national competitions may be the norm, and music teachers help focus and prepare students for the dynamics of live performances. Both private and public school music programs, of all grades, benefit from highly qualified and passionate music teachers. In addition to a knowledge of music and performance, earning a Master’s in Music Education is helpful for opening your own studio, franchising or working as a studio teacher in an already established school. Being involved with a music studio can be a fantastic way to use your creative energies and give back to the music community by teaching your love of music. The earning potential depends on the region and other qualifications. With an advanced degree and a good background in teaching, a career as a music consultant or supervisor, combines music and visual media. An extensive knowledge in music, teaching and the current trends in both areas, as well as being a good decision maker and adviser are pivotal to this career option. Typically, a music supervisor handles the process of choosing, negotiating, and incorporating pieces of music into visual media (such as a television show or movie), and acts as a liason between the creative and business ends of this process. This position is most active within media based industries, including live events, television, film, advertising, theatre, and video gaming. Music supervisors may work within production companies, film studios, networks, music supervision companies, or do freelance work. Some music consultants/supervisors earn as much as $70,000 a year, again depending on qualifications and location. Outside of jobs in schools and universities, there are a number of career options available for music instructors. Local choir and ensemble groups need music directors and private instructors are needed for all ages. When the art of teaching comes together with music, teachers and students benefit emotionally, physically and spiritually. 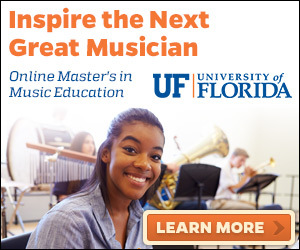 Wherever a Master of Music Education graduate’s passion lies, there are students willing and eager for instruction.